Still another hometown boy destined to make his way in the world, Ed Broenniman, busy as a youngster in helping his widowed mother support her family, found time to peer in the wide doors [of the Globe Mill], inhaling the floury aroma of a well kept mill, an aroma clinging to him throughout a busy life, first as a salesman in midwestern territory for his boyhood mill, and shortly before the turn of the century as an established flour broker in the New York market, his firm becoming an outstanding factor in that city's trade. It was his knowledge of flour and markets, nurtured first at this mill, that led to his logical appointment by Herbert Hoover to handle all Belgium Red Cross Relief purchases during and following the First World War, transactions totaling in excess of $350,000,000. He also served at this time on the British Wheat Purchasing Agency. For more than fifty years Globe flour has been and still is a matter of Ed Broenniman's personal interest and concern. Source: "The Globe Milling Company, Watertown, Wisconsin, 1845-1945." Edward G. Broenniman was one of three Watertown boys who went out into the world and landed big. The other two were Ralph Blumenfeld, the London editor, and Joseph Davies, Russian and Belgian Ambassador. Mr. Broenniman arrived in New York in 1897 and became a leader in the wholesale flour business and vice-president of the Produce Exchange in 1914. He resigned to serve on the Belgian relief commission as assistant to Herbert Hoover during World War I. In his youth Mr. Broenniman supported his family for a time after the sudden death of his father. An early business venture showed his enterprise. Enlarged photographs in heavy wooden frames were very popular at the time, and Edward trudged through the countryside taking orders from farmers. When it came time to deliver, he marshaled his two young brothers to help him carry the bulky pictures, which were to be transported by train. He still rode for half fare; his brothers rode free. But the pictures filled a number of seats, and the trainman must have looked on with amazement while the three youngsters carried their wares into the cars. Mr. Broenniman's sister Lydia married Oscar Wertheimer. His half-sister, Gladys Mollart, the curator of the Octagon House, was the daughter of his mother's second marriage to Lobegott Mollart. Pages 212 and 213 of Watertown Remembered. Still another hometown boy destined to make his way in the world, Ed Broenniman, busy as a youngster in helping his widowed mother support her family, found time to peer in the wide doors [of the Globe Mill], inhaling the floury aroma of a well kept mill, an aroma clinging to him throughout a busy life, first as a salesman in midwestern territory for his boyhood mill, and shortly before the turn of the century as an established flour broker in the New York market, his firm becoming an outstanding factor in that city's trade. It was his knowledge of flour and markets, nurtured first at this mill, that led to his logical appointment by Herbert Hoover to handle all Belgium Red Cross Relief purchases during and following the First World War, transactions totaling in excess of $350,000,000. He also served at this time on the British Wheat Purchasing Agency. For more than fifty years Globe flour has been and still is a matter of Ed Broenniman's personal interest and concern. Derived from the booklet "The Globe Milling Company, Watertown, Wisconsin, 1845-1945." 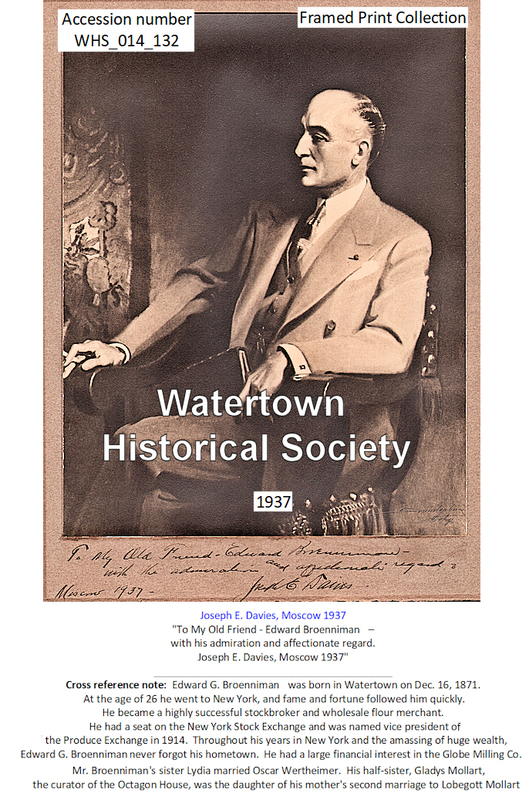 A couple weeks ago we were working on the Glimpses of the Past and ran into some information on one of Watertown’s big names, that of Edward G. Broenniman. Edward G. Broenniman was born in Watertown on Dec. 16, 1871, son of Mr. and Mrs. Gottlieb Broenniman. As a young boy he showed his entrepreneurship by helping provide income for his family after his father died at a young age. Enlarged photographs in heavy wooden frames were popular back in that era and Edward would travel through the countryside taking orders from farmers. Then, when it was time to deliver the orders he enlisted the support of his two younger brothers to haul these heavy photos onto trains where they were distributed at various stops along the way. In 1897, at the age of 26, he went to New York, and fame and fortune followed him quickly. He became a highly successful stockbroker and wholesale flour merchant. He had a seat on the New York Stock Exchange and was named vice president of the Produce Exchange in 1914. It wasn’t long after that appointment when he resigned his position to work for the federal government, leading the relief efforts in Belgium which was in tough economic shape because of World War I. He held more jobs, also serving as the first assistant to Herbert Hoover in the food administration. In that time, he’d spend three days a week in Washington as assistant food administrator and three days in New York purchasing the badly needed supplies for the Belgian people. Throughout all of his years in New York and the amassing of huge wealth, Edward G. Broenniman never forgot his hometown. He had a large financial interest in the Globe Milling Company which was located on the west side of the Rock River on South Water Street, near the dam. He came back for the business’ board meetings. He also enjoyed coming back and seeing the familiar surroundings of his hometown as well as conversing with some of his old friends. He was a lifelong member of Lodge No. 49, Free and Accepted Masons. In a visit back to our city in 1945 he was honored for his 50-year membership. In 1937 these three giants in Watertown history held a reunion in London at the country home of Blumenfeld. Davies and Broenniman had been in England to attend the coronation of King George VI and after that big event, they gathered at the Blumenfeld home. Also in 1937, Broenniman traveled to Moscow where he was greeted by Davies who at the time was servings as ambassador to Russia. See image thumb below. Derived from “Times Square” column, Watertown Daily Times. with his admiration and affectionate regard. Joseph E. Davies, Moscow 1937"